It’s been with us since 1990, when the first (now highly-collectable) silver-with-yellow highlights model arrived with the Evolution motor and a name which just happened to evoke nuclear bombs. Harley has always claimed it’s a coincidence the Fat Man and Little Boy nuclear bombs have similar names to its now iconic Softail cruiser, but I’m not sure anyone believes them. 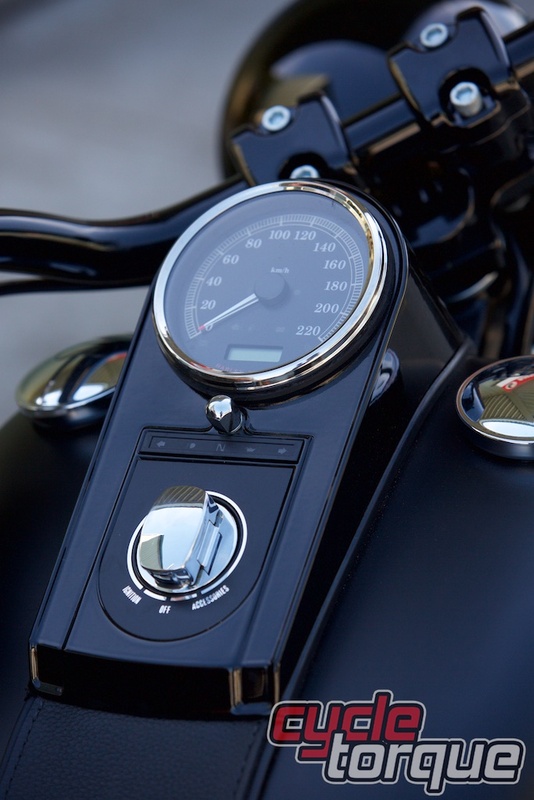 After all, by 1989 Harley-Davidson was back in the black, helped by a short period of tariff protection in its home market combined with better quality control and bikes better suiting what the market wanted. The conspiracy theorists have a field-day talking about how the first model is painted a similar colour to the Enola Gay, the bomber which dropped the first atomic bomb on Japan, how the original tank emblem looks like the US Air Force’s logo… but it really doesn’t matter. Harley was back, and riders sure wanted the Fat Boy, and it sold in droves. Getting one required months on a waiting list, something that would persist for years. Is the Fat Boy still relevant? The Fat Boy is nowhere near as popular as it once was. The Breakout, with its drag-race inspired ’bars, super-fat rear tyre and muscular stance is outselling the Fat Boy by a huge margin, and the Street 500 – aimed at riders younger than the Fat Boy’s model run – outsells the Breakout. So has Harley been able to do enough to keep the Fat Boy relevant? When Harley adds an ‘S’ to a model, it’s more than just a styling exercise – indeed, with the Fat Boy there are few obvious changes to the untrained eye. Of course park a new Fat Boy S next to an earlier model and the differences become more noticeable, but it’s also obvious Harley-Davidson’s designers wanted to keep the silhouette, which is the essence of the Fat Boy, unchanged. There are still solid disc wheels, albeit lined with a ring of ‘bullet’ holes, the wide, low handlebars, King/Queen seat, fat chopped guards, forward-set floorboard controls and a style which seems ageless. 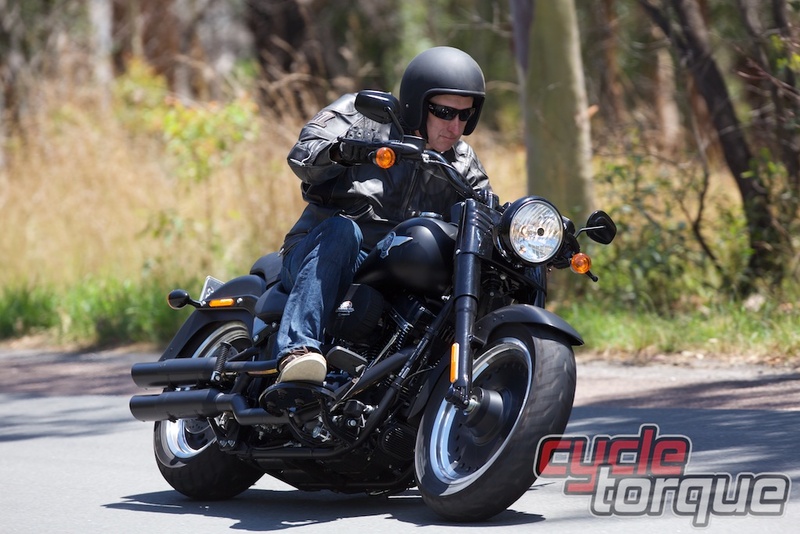 Fat Boys have been sold in many colours over the years, but the Fat Boy S is a blacked-out model – any colour you like, as long as it’s black. But there’s Vivid Black (gloss) and Black Denim (matt), so you don’t actually get out of choosing. Throw a leg over the Fat Boy S and it really doesn’t feel much different to the earlier models. Pull it up off the sidestand and you’ll remember why Harley-Davidson described itself as a manufacturer of heavyweight motorcycles. Fire up the powerplant and you’ll feel the shake shake shake of the V-twin at idle. Drop it into gear and you’ll be rewarded with a clunk which will register on a local seismometer. Give it some revs and let out the clutch and it’ll accelerate like no standard Fat Boy before it. 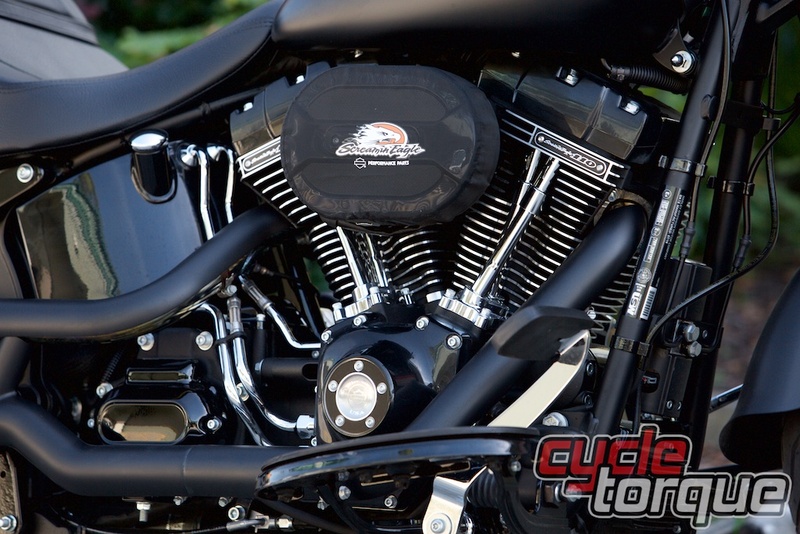 The Fat Boy S gets 110-inch CVO performance. It is still an air-cooled 45-degree two-valve motor, but the extra capacity and better breathing (through a Screamin’ Eagle air filter) in particular help the Fat Boy S develop massive torque from right down low in the rev range, so the bike rockets away from traffic lights like no Fat Boy before it. No, that doesn’t mean it’s going to outrun a lightweight sportsbike, although it might if the sportsbike has a passenger – then they can be difficult to get off the line, where the Fat Boy S is easy, because the wide spread of power makes getting the clutch out a breeze (although holding in the heavy clutch isn’t for wimps). The shakes mostly disappear when you’re rolling, the counter-balanced motor only passing through a beat to remind you there’s an engine between your legs bigger than the one in your first love’s car. 110ci is 1801cc, which is a seriously big motorcycle engine, and it produces prodigious amounts of torque – 146Nm at 4000 revs according the specifications chart. Surprisingly that’s only an extra 10Nm of torque compared to the other Fat Boys in the range, and it’s produced at 4000rpm rather than 3000. The Motor Company doesn’t quote horsepower figures, because they aren’t high or relevant. Ride one and you’ll understand, this bike isn’t about horsepower, but that doesn’t make it slow. 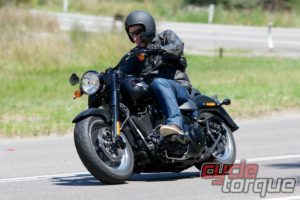 It doesn’t get much publicity, but Harley-Davidson has been gradually refining the frame, suspension and running gear on the Fat Boy since its introduction, and this is the best-handling one so far. With its long, low profile, heavy, fat wheels and short-travel suspension it’s never going to set lap records, but it certainly doesn’t wallow around or twist and shimmy like some of the old ones. The early models had pair of 16-inch wheels but they grew some years back to 17s without compromising the style of the bike. The rear tyre is currently a 200-section, so it’s fat and good looking. In fact the chassis and suspension are now so predictable the problem is now cornering clearance – not that any Fat Boy has really had any now or in the past, but the better handling means the limits of clearance will be explored more, and I found myself scraping the boards all the time on the Fat Boy. Sure the 140-section front tyre makes the steering a bit slow, but the Fat Boy S rolls into corners nicely. My usual response to people complaining about cornering clearance on cruisers is ‘you’re riding the wrong bike for you’, because cruisers are not designed for aggressive cornering – but the issue with the Fat Boy S is it’s actually good fun through twisty bends, and I kept running out of cornering clearance without taxing the frame or suspension. The brakes, however, are another matter. Harley-Davidson compromises a lot for the sake of style. Its bikes could be a lot lighter, cheaper and faster if it were willing to use different metals, manufacturing processes and components… but then they wouldn’t be Harleys. 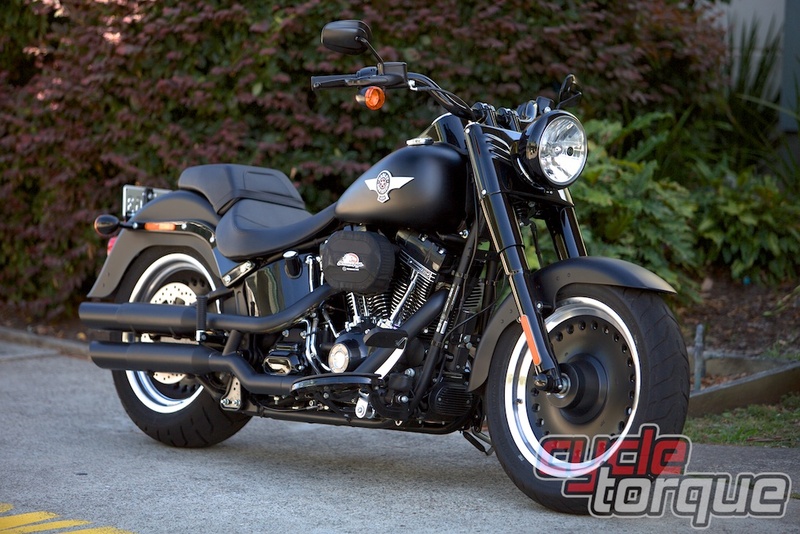 So it’s no surprise to me at all the Fat Boy still only has one front disc brake (indeed, the first Softail to get a twin-disc front end was the 2016 CVO Breakout). Unfortunately, despite being a four-piston caliper, it’s a weak point in the Fat Boy S, the extra performance of the engine highlighting the moderate stopping power of the brakes. The huge contact patch of the fat tyres and little front-end dive mean you can get quite a bit of stopping performance from the rear brake, and you need it to help out the front sometimes. Hidden away is Harley’s Anti Lock Braking System, there if you need it but not advertised in any way. At moderate speeds motorcycles you’d have to buy a touring bike to be more comfortable, but if the weather’s hot I’d rather ride the Fat Boy S.
The low seat is nicely padded and comfortable, although it locks you into one spot because of its shape. There’s a bit of a reach forward to the wide ’bars but the floorboards are just where you expect them. It’s a comfortable ride up to highway speeds, where I started to feel like a windsock with my arms spread out and sitting bolt upright. But if that’s a problem Harley offers a range of touring machines, or you could just buy a screen for the Fat Boy from Harley’s extensive accessory catalogue. The gearbox is a clunky six-speeder, but I never missed a shift. The clutch is heavy, the ’bars are fat and there’s belt final drive, just as you’d expect. Harley-Davidson does an incredible job of supplying modern electronics with its bike, but doesn’t make a song and dance about it. I’ve already mentioned how the bike has ABS and cruise control, and nearly all Harleys have been fuel injected for years. Modern Harley electrics look traditional. The instruments look like something out of the 1950s, a big central speedo dial. But hidden inside are numerous warning lights, almost invisible unless lit up and a small LCD panel. The instruments can display odometer, time-of-day clock on odometer, dual tripmeter, RPM/gear display, fuel gauge with low fuel warning light and countdown feature, low oil pressure indicator light, engine diagnostics readout, LED indicator lights and 6-speed indicator light. 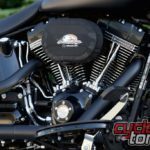 The extra grunt of the 110ci engine for the S-model adds $2500 to the price of the standard Fat Boy ($29,250), while the Fat Boy Lo is definitely the bargain of the trio, starting at $28,995. So a Fat Boy S will cost you $31,750 plus on-road costs and any extras you like from the Harley-Davidson accessory catalogue. Is it worth it? I think so, but of course it comes down to your perspective. I like the extra grunt and free-revving engine, but I also like having the cruise control, and that’s only standard on the S.
Of course it’s impossible to say any Fat Boy is good value with a straight face unless you also start to wax lyrical about how the bike feels, about how to caresses the soul while rolling you down the road, how the value is in the years of ownership… basically if you like the Fat Boy the price is unlikely to shock you and if you can’t understand why someone would spend over $30,000 for a naked cruiser when you can buy a perfectly functional Japanese machine for less than half the price… if that’s the case none of the Fat Boy models are for you. 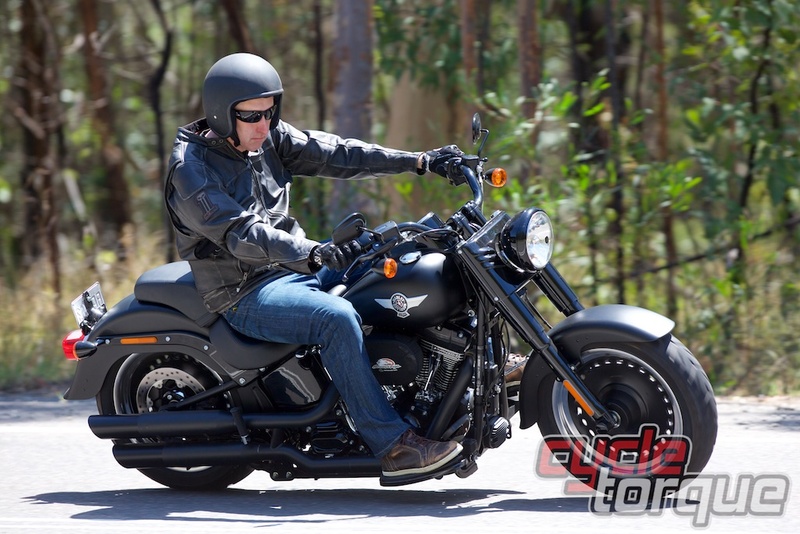 Introducing the Fat Boy S has bounced the model back into the top ten cruisers for Australia, so not only is the machine a good bike, it’s also resonating with the market. The updates have held a fine line between not wanting to destroy what made the Fat Boy popular, but making sure the new model offered something for owners looking to trade up and enticing riders who had never owned a Fat Boy before to try one out. It’s a bit of a shame the Fat Boy S is only available in two different tones of black, but that might change in the future – and it looks like the future of the Fat Boy will be guaranteed for a while yet.